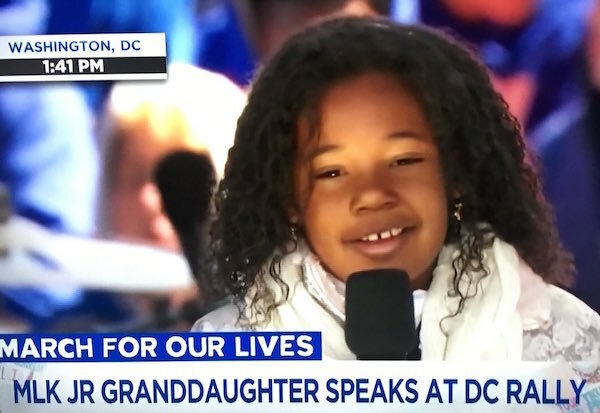 The nine-year-old granddaughter of Martin Luther King Jr. made a rousing appearance at a huge protest for gun control in Washington on Saturday, saying that like the slain civil rights leader she too has a dream -- "a gun-free world." The poised young girl made a surprise appearance at the "March For Our Lives" rally, held near the National Mall where her grandfather delivered his "I Have a Dream" speech calling for an end to racism in the United States in August 1963. "My grandfather had a dream that his four little children will not be judged by the color of their skin but by the content of their character," Yolanda Renee King told the crowd. "I have a dream that enough is enough," she said. "And that this should be a gun-free world -- period." She then led the rapt crowd in a chant. "Spread the word have you heard, all across the nation, we are going to be a great generation," she said. A crowd estimated to be in the hundreds of thousands attended the "March For Our Lives" in Washington calling for tougher US gun laws -- less than two weeks before the 50th anniversary of the fatal shooting of Martin Luther King Jr. in 1968. Large rallies were also held in scores of cities across the country. The protests were organized by students at Marjory Douglas Stoneman High School in Parkland, Florida, where 14 students and three adult faculty members were shot dead by a troubled 19-year-old former classmate on February 14.